Those of you who know me know that I live to bake! Ever since I was little I have loved baking. I spent many weekends at Nan’s place whipping up cakes, biscuits, slices, puddings, dumplings and the odd batch of pancakes. 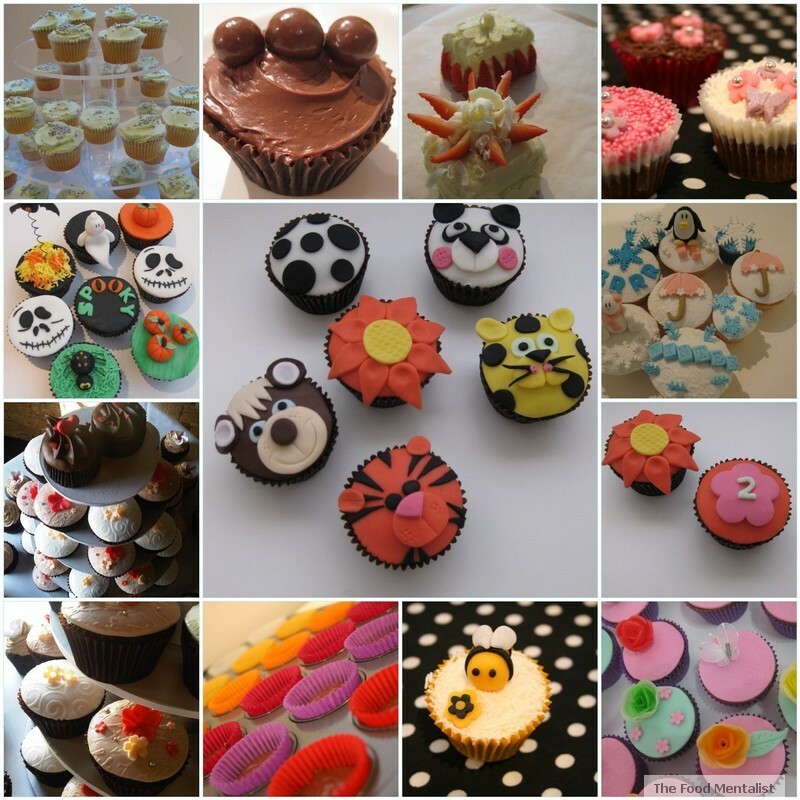 Over the last 12 months I have made quite a few cupcakes, some great, some not so great. I wanted to share with you all some of my favourite cupcakes. Most of them were the result of experiments and others were made for friends or work colleagues. I hope you enjoy my Tour de Cupcake. Not your traditional cupcake, these mini cakes were born out of a failed attempt to perfect a white chocolate mudcake recipe. The cooking time for the original recipe didn't quite match the mood of my oven on this particular day and so I was left with a gooey mudcake centre. Having to produce something for an afternoon tea at my Nan's and not wanting to waste the entire cake, I cut out the centre and used its surrounds to make these mini square cakes. A square cupcake perhaps, minus the patty case. I filled and covered them in white chocolate ganache and decorated them with white chocolate shavings and chopped strawberries. I also melted some white chocolate and poured it on to some non stick paper and placed it into the fridge. Once it was firm I used love heart shaped cutters to cut out several love hearts and arranged them into a flower pattern on some of the cakes.The cakes tasted absolutely amazing and disaster was averted! White Chocolate mudcake base and ganache, strawberries, white chocolate decoration. These cupcakes were for a friend of a friends wedding last year. There were 80 in total and involved quite a bit of work. The bride requested neutral colours of latte and cream with scarlet/orange accents to match the bridesmaids dresses. I used textured mats to achieve the script patterns on the cupcakes and made a combination of flowers both small and medium to decorate each cupcake. I also used silver cachos. I am very proud of the finished product and would have to say that these one of my all time favourite cake decorating feats. Chocolate mudcake base. chocolate ganache, fondant detail. All 120 of these bite size cupcakes were made for a friend of Miss L's who was having a Christening for her daughter and two cousins. They were so cute and a lot of fun to make and decorate. I find there is nothing better than a good buttercake or vanilla cake with buttercream, YUMMO! Buttercake base with buttercream icing in lime and cream colours with silver cachos. 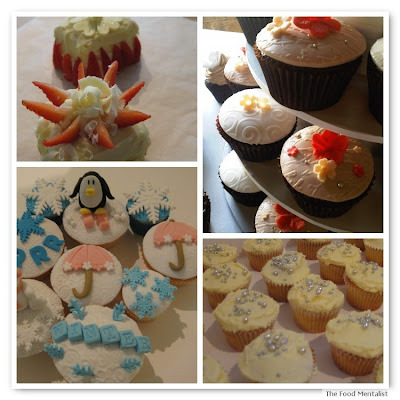 Inspired by all things cold and wintry, these cupcakes were a lot of fun to make. I entered these into a winter themed cupcake competition. There were so many amazing entries and these too took ages to complete. My favourite is the little penguin on skis. Chocolate mudcake base, chocolate ganache and fondant detail. Choc-vanilla pound cake, dark chocolate ganache, fondant and rice paper detail. I made these ones during my chocolate addiction phase and shared them with a few girlfriends one afternoon. They were super good and very rich! Chocolate mudcake base, chocolate icing, maltesers. No, these weren’t inspired by George Orwell’s classic. These are one of my favourites! I had been meaning to try out some animal design cupcakes for the longest time and these were the final result. They took hours but were a lot of fun. I got Mum to help out and I think I tested her patience. I ended up giving some of them to Girlfriday and Mum took the rest home to share with her neighbours. Chocolate mudcake base, chocolate ganache, fondant detail. 4. 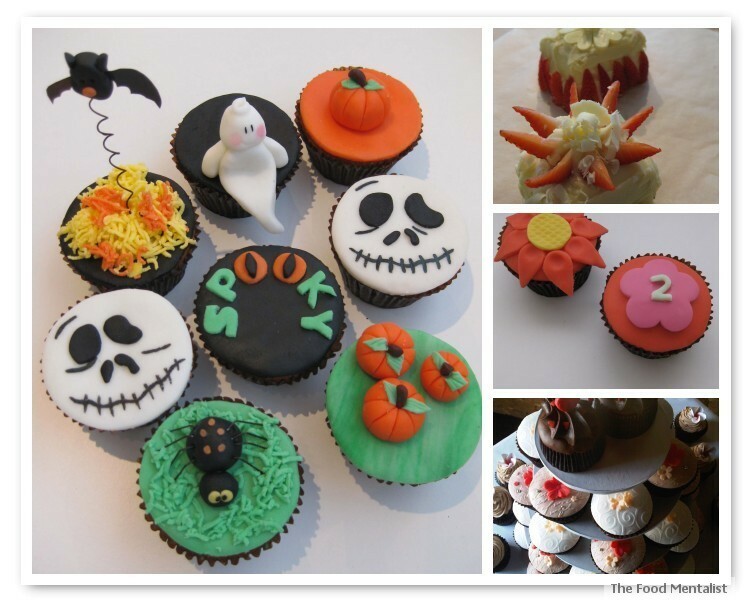 I made these for entry into a Halloween cupcake decorating competition and was lucky to receive the runner up prize which included a Donna Hay chocolate cupcake kit ( which was absolutely scrumptious by the way!) and it came with cute little cupcake cases. I also received some gorgeous crown sugar decorations that you can sit on the lip of your glass or mug, perfect for cocktails. 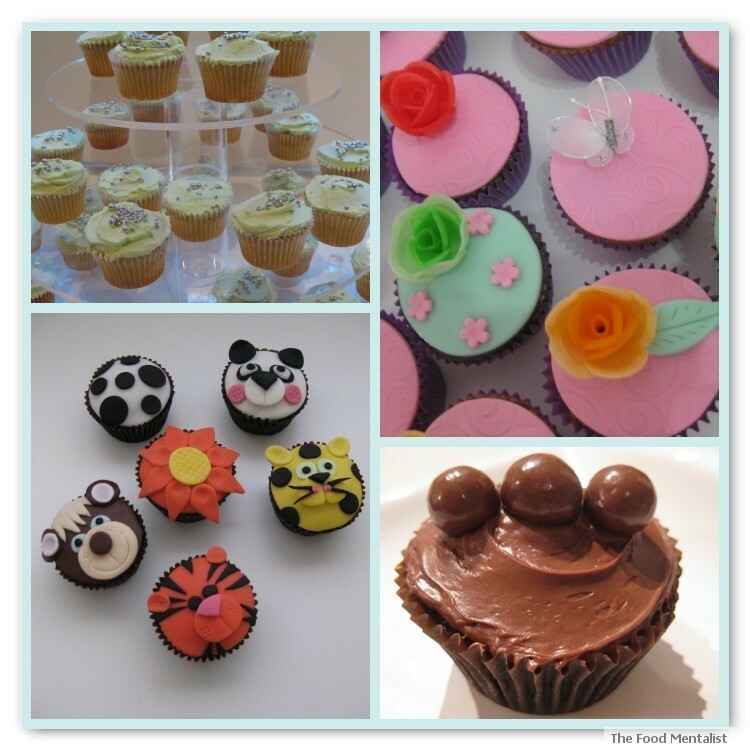 These cupcakes took SO long to decorate, ahhh but it was worth it, another favourite of mine. I used a combination of techniques for these some of which included marbling green fondant, grating fondant (yellow,orange and green), using sewing thread to get the deep cuts in the mini pumpkins, and twisting and painting floral wire (bat stand and spider legs). Chocolate mudcake base, ganache, fondant detail. Another experiment, I had bought some new cutters which included a whole range of mini number cutters. I chose to make some number and flower inspired designs and these were the result. I absolutely adore the orange flower one. I first made this flower when I made the Animal Farm cupcakes using a leaf cutter and a balling tool to make the indent. I also used a textured mat to decorate the round yellow centre. Another experiment, I wanted to do the bee thing and boy were they fiddly little things. I got the inspiration from Debbie Brown who is a master cake decorator. These cupcakes were bite size and I made a large batch and decorated some with bees and others with different coloured sugared roses to match the paper cases. I hope you have enjoyed my Tour de Cupcake, I look forward to sharing many new designs and experiments with you all in the future. Aww I really enjoyed your tour de cupcake! My favourite would have to be the Halloween and winter ones. They are adorable! You are absolutely the Cupcake Master!! Wow... I haven't baked cupcakes since I was a kid, and they definitely came out looking like cupcakes baked by a kid ;) I adore the Sunshine State cupcakes, both aesthetically and for the meaning behind them. And the Busy Bee ones just make me go "aww!" wow awesome roundup! super loved your winter wonderland cupcakes and aww <3 the bees! Wow, these are amazing. You are so talented. Genius you are, a creative genius!